Males weigh up to 1,750 pounds at maturity; 10 feet tall. Females weigh a maximum of 650 pounds; roughly 8 feet tall (15 cm). Polar bears are similar in size to brown bears but have an elongated neck and head. The prevailing theory is that a population of brown bears became isolated in Siberia and quickly evolved into polar bears. Their yellowish coat is a result of natural staining and oxidation of seal oil. Life Cycle: While polar bears generally mate during March to May, males have been known to father several offspring in a single season. Implantation is delayed until autumn, and cubs are born from late-November to mid-January. Although some cubs are born in earth dens, most births occur in snow dens that may be occupied between 5-6 months. Cubs weigh barely a pound, and are blind, deaf, poorly insulated, and unable to walk or smell. They remain with their mother for well over 2 years, until they can hunt on their own. Most litters consist of 2 cubs with some single and triple births; 4 cubs are rare. 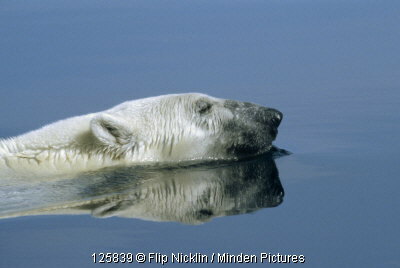 Once mature, polar bears tend to be loners, although they have been known to tolerate each other's company on occasion. Polar bear longevity is approximately 20-25 years. Feeding: Their aquatic aptitude plays an integral role in hunting seals -- ringed and bearded seals are the most frequent prey -- and, occasionally, walrus pups. Some believe that native people of the Arctic learned to hunt seals by watching the bear's techniques. The bears have an incredible sense of smell, which assists in hunting. Seal is their primary food and a bear can kill an 800-pound seal with one swipe of its paw. Behavior: Polar bears are drawn together by food: when a bear finds a good seal hunting area, others bears are likely to arrive at the same place within a day or so. In 1980, scientists noted 56 of them at a bowhead whale carcass. How the bears find their way to these places is unknown. Odor probably plays a role; however the bears come from all directions. Distribution: Habitants of icy environs in Alaska, Canada, Russia, Greenland, Denmark and Norway, polar bears have been known to swim distances of over 40 miles to travel between ice floes during fall and winter months. A 2004-2009 study of female polar bears from the Beaufort Sea, Alaska recorded 50 ultra-marathon swims averaging 96 miles, and one bear was able to swim nearly 220 miles. The duration of the long-distance swims lasted from most of a day to nearly 10 days. Some polar bears live in these all-white climates year-round, while other polar bears roam on southern dry land during spring and summer. Threats and Status: Polar bears rely almost entirely on the marine sea ice environment for their survival so that large-scale changes in their habitat will impact the population. Global climate change possesses a substantial threat to the habitat of polar bears. Recent modeling of the trends for sea ice extent, thickness and timing of coverage predicts dramatic reductions in sea ice coverage over the next 50-100 years. Sea ice has declined considerably over the past half century. Additional declines of roughly 10-50% of annual sea ice are predicted by 2100. The summer sea ice is projected to decrease by 50-100% during the same period. In addition the quality of the remaining ice will decline. Scientists estimate that the polar bears’ population will decline >30% within three generations (45 years) due to decline in area of occupancy, extent of occurrence, and habitat quality. If climatic trends continue, polar bears may become extirpated from most of their range within 100 years. The polar bear itself is hunted by natives, who kill roughly 150 or so each year under terms granted by the Marine Mammal Protection Act of 1972. Some 20,000 to 25,000 polar bears exist worldwide; approximately 3,500 can be found in Alaska. These Arctic survivors are further protected by a 1976 conservation agreement between Canada, Norway, Russia, the U.S. and Denmark. Because of ongoing and potential loss of their sea ice habitat resulting from climate change, polar bears were listed as a threatened species under the Endangered Species act in 2008. Other population stress factors that may also operate to impact polar bears’ survival include toxic contaminants, shipping, recreational viewing, oil and gas exploration and development. In addition to this comes a potential risk of over-harvest due to increased quotas, excessive quotas or no quotas in Canada and Greenland and poaching in Russia.